Crossville, Alabama is a small town in an area known as Sand Mountain in Northeast Alabama, and it is known for its history and tradition. Andrew Jackson battled the Creek Indians during the early 1800’s in parts of this area because 250 Alabama settlers had been brutally murdered by the Indians. Later Cherokee Indians inhabited parts of North Alabama, but they too were eventually pushed out as more American settlers moved in. This area of Alabama attracted early settlers because of the rich soil, nearby rivers and streams, bountiful game, and good climate. Most settlers moved from Georgia and Tennessee to establish the current towns and communities of North Alabama. 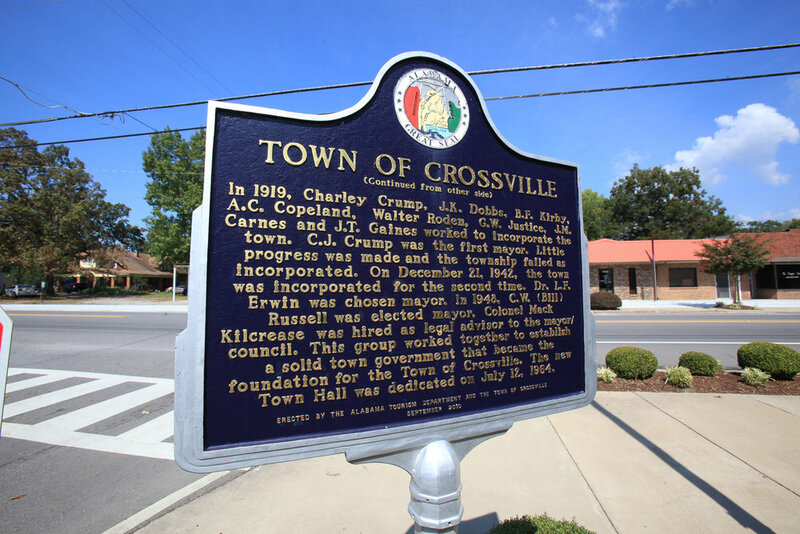 The little village of Crossville was named by James A. Copeland because of the many crossroads in the area. In 1888, G.W. Justice established the first business in Crossville, and then in 1903, W.B. Jones installed machinery for his cotton mills. In the middle 1800’s mail was brought through Crossville from Rome, Georgia and Guntersville, Alabama by Stage Coach. Soon the town had its first U.S. Post Office, with A.C. Copeland serving as the first Postmaster. The first church to be established in the Crossville area was a Methodist Episcopal Church, called Pine Bark Church. It was formed just before the War between the States. The first Baptist Church of the community was established in 1892 at Union Grove. Later in 1925, several people started meeting at the high school and formed the First Baptist Church of Crossville. A new sanctuary was built in 1926. Crossville established its first school in the late 1800’s at Bryant’s Chapel Church. The first school house was a large, one room structure with one teacher and around 50 students. The first banking institution was established in 1914 by N.W. Black and Boyce Rains. Sometime in late 1920’s or early 1930’s, Crossville was incorporated and C. J. Crump became the first Mayor. Under his leadership little progress was made and the Township failed as an incorporated town. In 1942, efforts were made to incorporate Crossville again. Application was made, the provisions were met, and the town was incorporated on December 21, 1942, for the second time. Dr. L.F. Erwin was chosen Mayor, and the town government established ordinances and privilege licenses (taxes) were levied. Collection enforcement was lax resulting in insufficient resources to maintain basic town services. Then C.W. (Bill) Russell was elected Mayor. One of the first things he did was hire Colonel Mack Kilcrease as a Legal Advisor to the mayor and council. This group worked together to establish a solid town government with taxation, collection and basic town services that became the foundation for the Town of Crossville. Crossville is a small country town in rural Northeast Alabama, but tremendous progress has been made since the early times. The Town has many new businesses, medical facilities, government services, and improved schools and recreation facilities that together make Crossville a great place to live, work and play. Family life in Crossville is great because of the schools, churches and community organizations. Rich in history and tradition, a beautiful landscape with old farms and new subdivisions, a sound City Government providing excellent services to the people, Crossville will always be a good place to settle and raise a family.